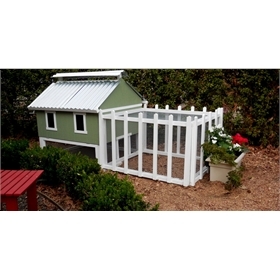 This Cold Weather Package was created especially for owners of the Smart Chicken Coop! 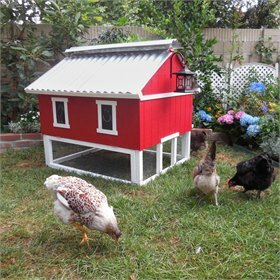 If you have cold winters that regularly drop below thirty degrees, you'll want to cover the lower screened panels to protect your girls from drafts, as this coop has no floor. You can put together something yourself if you have extra plywood or tarp material laying around the house, or you can purchase our cold weather package from the pull-down menu above. Our Winterizer Coop Pack comes with 5 twin wall clear poly covers. The twin wall adds extra insulation and is what is used for greenhouses across the country. They are easily and quickly mountable, yet store easily during the warm months. Our screen covers are made from standard greenhouse material, which, with the trapped air space between its dual walls, insulates better AND lets in the sunlight. 1. Each panel has a side that is labeled sun resistant (UV resistant). Remove the protective coating from the panels. Place some kind of mark, such as a black marker ‘X’, in one of the corners of the UV resistant side of each of the panels. This mark ensures that you can tell which side is sun resistant and should face outward. 2. Place Screen Covers over each respectively sized screen with the UV resistant side facing out. 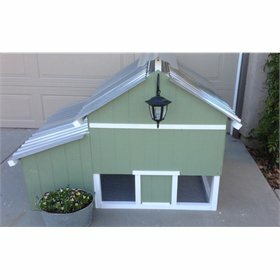 The covers go on the outside of the coop, in the window "frame". 3. Insert bolts through the front of the screen cover. From inside, place washer on the bolt and then a wing nut. Tighten to secure.